Last Monday, I flew out to California for an event at NASA's Armstrong Flight Research Center. But I landed so early in the day at LAX, I decided to make the best use of my time by watching planes land from the famous In-N-Out Burger on the east side of the airport. Southwest's Boeing 737-700 "Nevada One"
The best time of day to be there is in the afternoon and early evening, because in the morning, the "marine layer" of clouds hasn't burned off yet, and can make the background of your photos look a bit dull (see photo above). Due to my schedule, I was out there from about 9:30AM to 11:00AM — not ideal, but I had to take the opportunity anyway. So here are some more pics of the more interesting planes I saw while I was out there. I didn't bother taking pics of the smaller commuter jets. Air Canada Rouge Airbus A319 - first time I'd seen Rouge in person. China Eastern Airbus A340-600 in special "Expo 2010" livery. Now, here are some photos I took a few years ago at the same location, but later in the day to give an idea of the changing lighting conditions. These were taken in September, if I remember correctly, so the sun position played a big factor in providing these silhouetted shots. 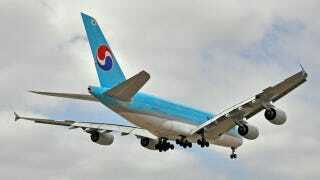 Top photo - Korean Airlines Airbus A380-800. All photos were taken by the author, Paul Thompson.